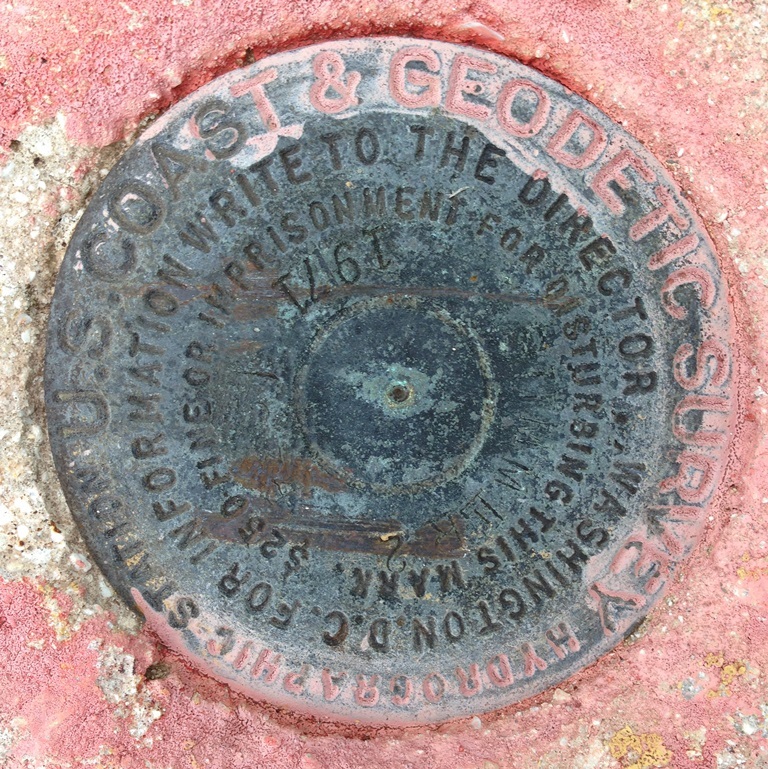 I'm pretty sure it's a flat disk, but NGS Surveyor is looking for Coast & Geodetic Disks. Very unusual as I've never seen the words New York cast in that series of benchmarks. MB1249(HOBAN) is on the grounds of Hoban High School, on the north side of 5th Avenue in Akron(west of and up the hill from Arlington Street), overlooking Interstate 76. There are quite a few of these city/USC&GS disks in Akron, but most of them are in wells and they tend to get flooded and/or very dirty. The one at Hoban is on high ground, which helped with the picture. Shorbird, Thanks for the info. I looked it up on GoogleEarth and its not too far from my cousin's place. The datasheet states it was set in 1963 so that agrees with the date you found on the cover. I recall that NGS did some work near Akron in the early 1970's, so it may have been a continuing cooperative project. NGS worked in GA for many years and also in CT for many years, both in cooperation with state survey agencies. Harry Dolphin, Interesting disk, but Difficult Run is correct, I'm looking for USC&GS and NGS disks, thanks. Thanks for the several recent photos. AstroD-Team – Your TRIANGULATION STATION disk, BANK 1921 is indeed unusual with that large triangle stamped in the center. The TRAVERSE STATION disks have a larger triangle than the standard TRIANGULATION STATION disk, but this looks like it could be even larger! Yes, that is a mighty large triangle that AstroD-Team logged. But something about it makes it look convex, not flat. The uneven lighting. George is right , a ruler would help. Note also the two 1909 disks that Harry Dolphin and I logged (QF0712 and QF0751), also have large triangles - but not as large. But, they do have a super duper large hole in the center of the triangle. I DID find that the building was built in 1906. There is a plaque on the front establishing it as a National Historic Building, constructed in 1906. 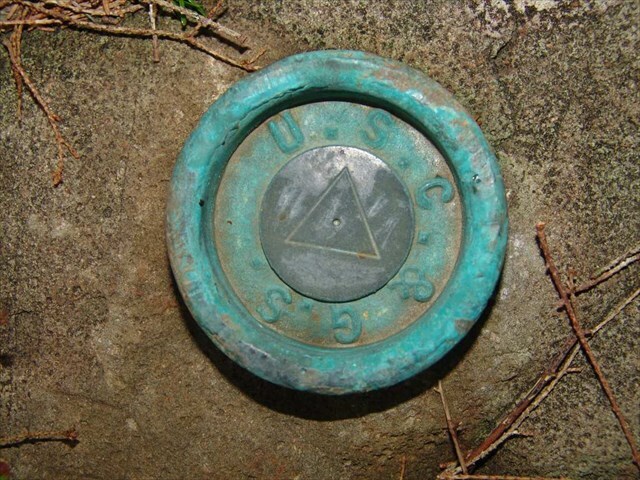 While this benchmark is not stamped as a USC&GS, I did find it unique for a triangulation station to have a raised center mark. This is the only 'flat-topped' mark that I've found to date. I'll have to keep searching this immediate area but all of the marks I've recovered so far, ranging in dates as far back as 1919 forward are all convex in shape...some more than others which makes me wonder just how much variability there is to the disk shapes? Regarding the flatness or curvature of USC&GS and NGS disks, the very old USC&GS flat disks were dead flat from edge to edge. The curved disks have a uniform curve from edge to edge. For photos of the old flat disks, see my photo gallery on FLICKR, and I just uploaded a JPEG drawing of a 1985 disk order showing that the spherical radius was 5 inches. See: http://www.flickr.com/photos/12262796@N06/3449543899/ for the disk drawing and browse through the images for the flat disks. I would like to offer it as an unusual USC&GS benchmark. It is stamped with "USC&G" and "B.M." I left it leaning against a fence. 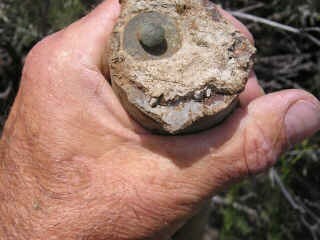 The mark itself was real basic, 1-1/2 inch pipe, the thin disk was only 1 inch in diameter. Looked like a cost saving effort by the USC&GS. I haven't seen anything like it. We're having a little trouble including our photos in this message, so in case it fails this time, we refer you to our Benchmarking log for SY2731. We finally got a shot of an old "cup" style disk, though its situation is somewhat depressing. The data sheet gives no description of the mark except to say it is lost, but the 1913 edition of CGS Special Publication 13, The California-Washington Arc of Primary Triangulation, gives a thorough description on p. 54. In the second edition, 1922, p. 33, the station is said to be lost. 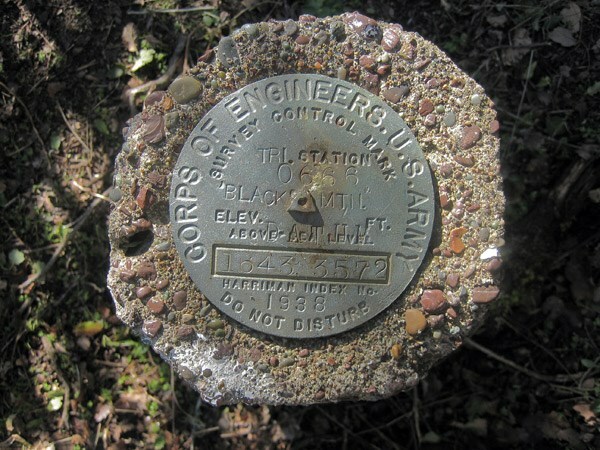 The 1913 description says in part that the station is five yards east of the east line of N Washington Street near the middle of 25th Street, in a boulder 18 by 24 by 30 inches, buried with its top about 5 inches below the surface of the ground. The station is now in the corner of a yard at the northeast corner of N Washington and 25th Streets. 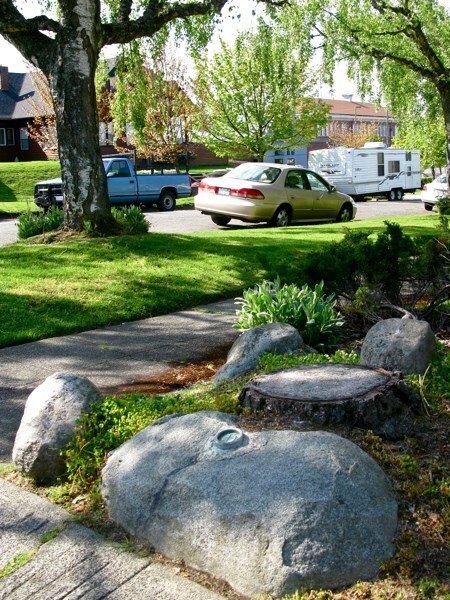 The boulder is almost all the way out of the ground and is part of a landscaping feature. The disk is significantly tilted toward the south. Reference marks are located in the data sheet and described in Special Publication 13, but we did not search for them, since the primary point cannot be located with certainty, and the RMs have to be under either pavement or well-kept lawn. The area shot looks northwesterly across the corner, toward N Washington on the N side of 25th. Would have been nice to find it in place. I don't want to scoop TheBeanTeam, but when looking at one of their recent logs, I think this disk might be of interest to you. 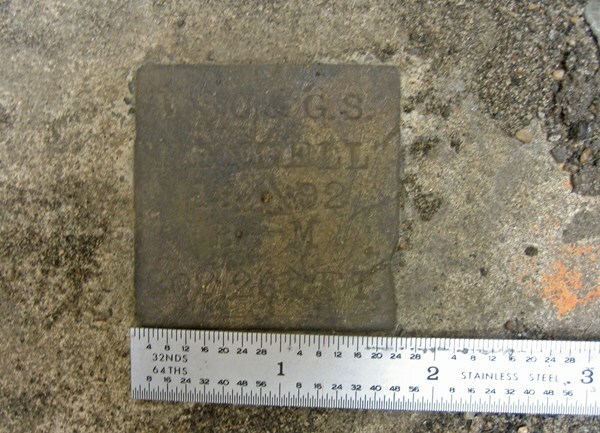 Flat, and maybe a little unusual (US C&GS 1917 magnetic station). Nice find & pictures, Beans! m&h, Wow, you found a mark reported as destroyed in 1922! Your photos came through fine, thanks. This is one of the 4 variations of the old “cup” style disks. (#1 – Two slashes completely across inner circle (yours), #2 – Two shorter slashes that do not go completely across the inner circle, #3 – A triangle in the center with no slashes, and #4 Nothing in the center (perhaps a punch hole)). From your description of the present situation and the statement in the old descriptions, it sounds like the boulder was moved, probably during road improvements (and this could have happened between 1913 and 1922). 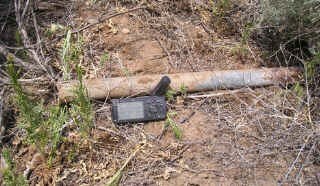 Klemmer & TeddyBearMama (and TheBeanTeam), Thanks for the photo of the old MAGNETIC STATION flat disk. I’m always interested in any of the rare, old, flat USC&GS disks (I’ve never even seen one in person.). These flat magnetic station disks were used from c1912 to c1921 and curved top MAGNETIC STATION disks were used c1921 to c1970. Thanks for the kind words regarding the photos. I was so exited to find this one and immediately thought of this tread. It was the best mark of the day even though I found several very interesting marks on that outing. Finally I had something that I was sure would be of interest in this thread. The first thing I did was check here after logging it on GC.com and found that it was one that Mega Scooter had mentioned earlier in post #28. Yep he was there before me. Since Mega Scooter didn't report it to NGS I was able to issue that report, so I had a wee bit of solace in the find. Thanks for the additional detail on the four types of "cup" disks. Incidentally, it's interesting that the disks were called "old-type" in the original setting description, which could have been as little as 2 years after the introduction of the flat-tops, as we have learned from your excellent article. Ooops! Didn't realize the disk had already been mentioned on this thread. Sorry! I found QE2396 BALD today. Maybe you'd like to see it? Here's a flat bench mark disk I found yesterday, mounted vertically on the wall of the train station in Kingman, AZ: FS0570 A 1. Date of monumentation is unknown. The building was recently painted and the painters were good enough to mask the disk, but I couldn't get all the tape residue off. There are a couple other pictures on the GC page that don't have the residue. Mega Scooter, Thanks for the excellent photos of a very green “old-style” cup disk. Your side view really shows how deep the center area is recessed. We have one of this type (with the triangle on the central, recessed area) mounted on a display here in NGS, but I have never seen one in the field. "I couldn't help but think of this comedy sketch when I read your log and took a gander at your photos for BALD"
Ha! I keep thinking that naming that mountain top Bald, is like naming a bald man Curly. I guess a lot can change in a hundred years. 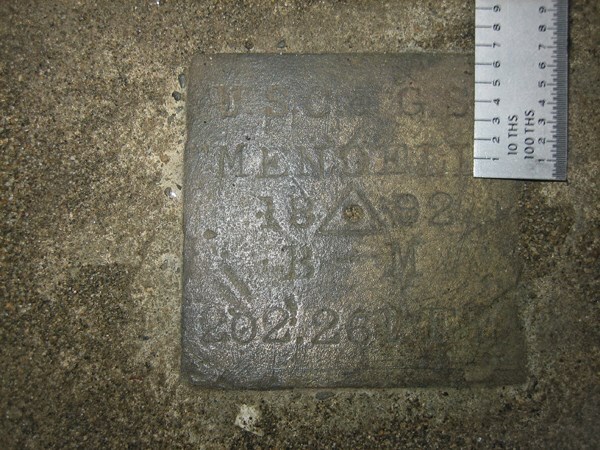 Does anyone have any photos of a USC&GS flat bench mark disk from 1903 or earlier? I have one of Z 3 1903 (HT0568) but it is a little blurry and I would like a sharp image. This disk had the following stamped around the outer edge “U.S. 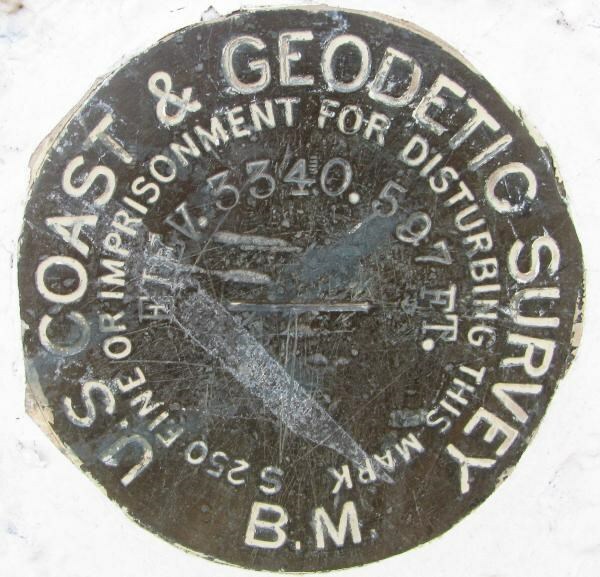 COAST & GEODETIC SURVEY B.M.” and a single slash in the center. Thanks. This contest for photos of old and unusual USC&GS survey disks will end on July 15th, so hurry and get some more photos in! Flat, square-shaped benchmark. Very unusual? I've never seen this shape before. Geoides, Your photo of station MENDELL is very interesting and indeed unusual. I can't tell from the photo or the description what the mark actually is. Is the lettering carved in stone or concrete, or is the lettering on a metal plate of some type? 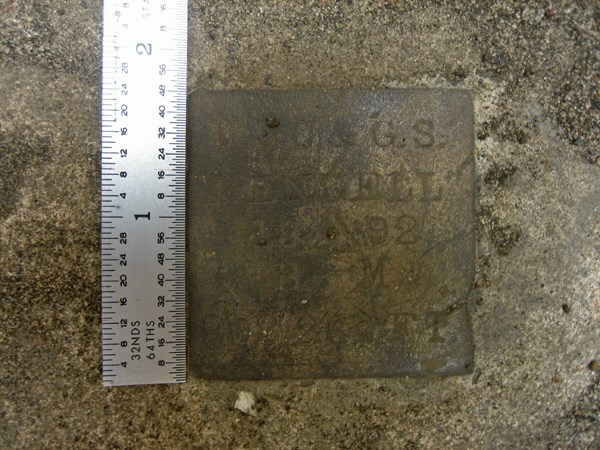 The station mark is a stamped plate set flush within the bottom of the concrete well and appears to be some type of alloy, definitely metal. The color of that plate did not come out very well in the image due to the late day flat light condition (foggy) but the plate's color appeared to my naked eye as a golden hue-silver in color. 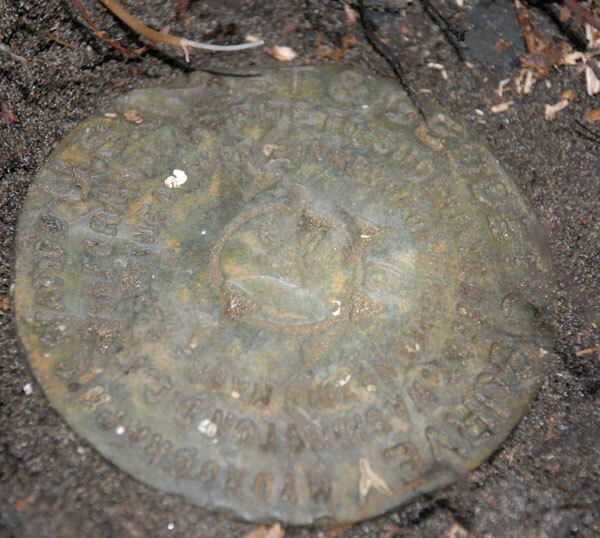 The plate's 'texture' was coarse, very granular in structure, Admiralty Brass Alloy perhaps? Also, when I first observed the mark, the surface of the mark was quite black from oxidation and when I cleaned the mark using water and a paper towel (due to the mark's age, I did not use my brushes in my benchmark hunting kit-steel, brass and nylon-for fear of damaging the mark itself) the residue on the paper towel also reminded me of what you see when polishing brass using 'Brasso' compound. What I find most interesting about this station, aside that it's quite possibly the oldest station in the San Francisco Bay Area, is the center punch mark which is inside a classic 'triangulation' station mark? If this station is a real triangulation mark then what/where are the Reference and Azimuth marks? The top of the triangle, when viewed in the posted image, points towards the centerline of the Golden Gate Bridge. But, the bridge was not constructed when this station was occupied. That leaves the possiblity of the Fort Point's Lighthouse Finial (first observed/declared a "Main Scheme Station" in 1916 but prior to that dating it was an intersection point). From the crude research into the surrounding stations in this immediate area, I could not detemine if any other stations have references back to this particular station. Most of the stations around here come after the 1926 timeline. Other than researching the current NGS archives, would there be any other way to research into station records that predate the 1892 timeframe? Geoides, Very interesting that this is a metal plate set in concrete. 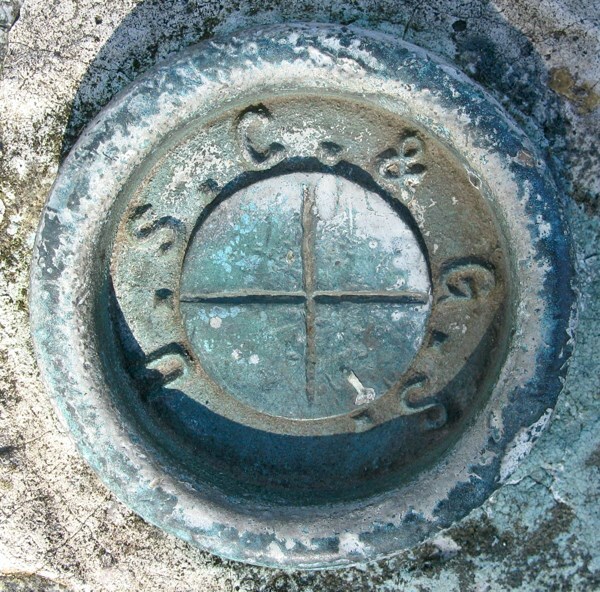 It might even be the “missing link” between marks with a few letters carved in stone (eg “U S C S”) and the standard round disks which USC&GS starting using about the year 1900. Do you know what the measurements of the plate are? According to the datasheet, this survey mark has an accurate elevation (first-order) but not an accurate horizontal position. Regarding the point of the triangle, I can’t recall ever hearing that the triangle corners pointed to other stations. 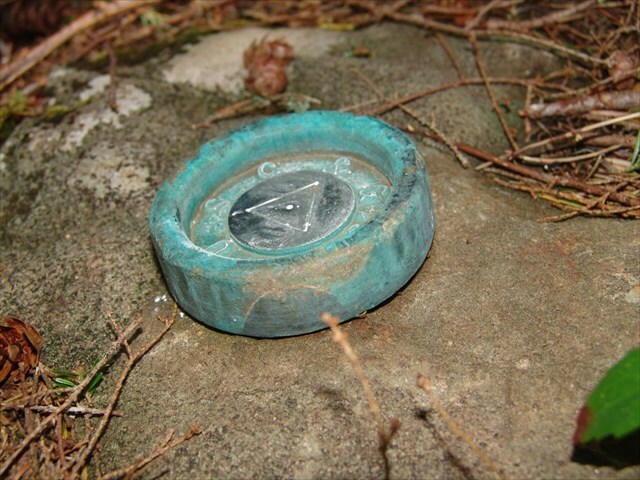 Sometimes lines were carved in rock radiating out away from the station and pointing to other marks, and sometimes nails were laid in the top of still wet concrete monuments also pointing to nearby stations. Regarding the center-punch mark inside the triangle, perhaps it was intended to later use this point as a triangulation station but it never happened. 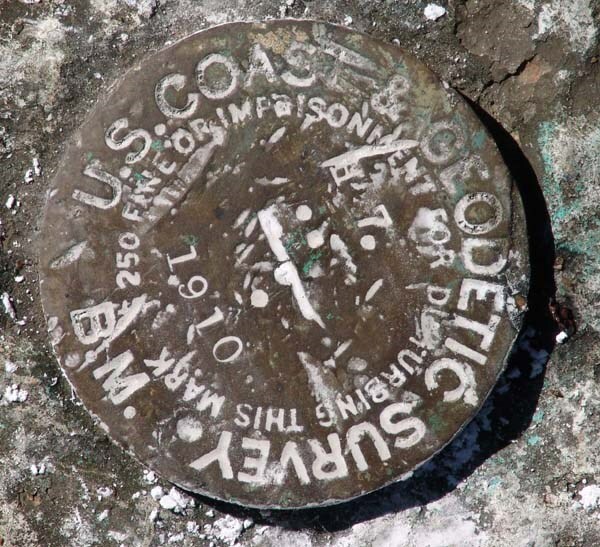 Regarding old stations in CA, the Coast Survey began surveying on the West Coast in about 1851. George Davidson was in charge of this for many years, see: http://www.history.noaa.gov/giants/davidson.html , and http://www.lib.noaa.gov/researchtools/subj...s.html#DAVIDSON . The Transcontinental Arc of Triangulation work in CA was done in the 1870s and 1880s, see Holoscenes excellent web site at: http://www.holoscenes.com/cgi-bin/moin.cgi/WesternSeries . Regarding research, the USC&GS Annual Reports are on-line at: http://docs.lib.noaa.gov/rescue/cgs/data_r...al_reports.html . Check out the reports around 1892. May I use your photo in my survey marks paper? You are quite welcome to use my photograph in your survey marks paper. All that I ask in return is the privilege of reading that paper when it's published. If you require a higher resolution image (the posted image is only 72 dpi @ 480x438) I can certainly e-mail a TIFF (or whatever format you require) to you. As for the mark itself, I did not take an actual measurement but the log by BThomas back in Dec. 2003 states ~1.25 sq. in. and that is very close based upon what I could tell at the time. 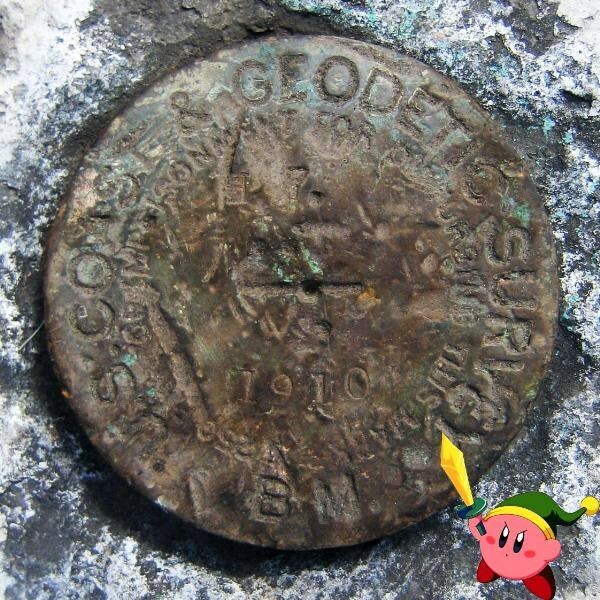 I plan on returning to obtain more information about the surrounding area as I've uncovered some additional 'historical' information about this mark and will take exact measurements at that time. And thank you for the additional resource material (links). That will keep me in reading material for some time! What I find most interesting about this station, aside that it's quite possibly the oldest station in the San Francisco Bay Area, is the center punch mark which is inside a classic 'triangulation' station mark? If this station is a real triangulation mark then what/where are the Reference and Azimuth marks? 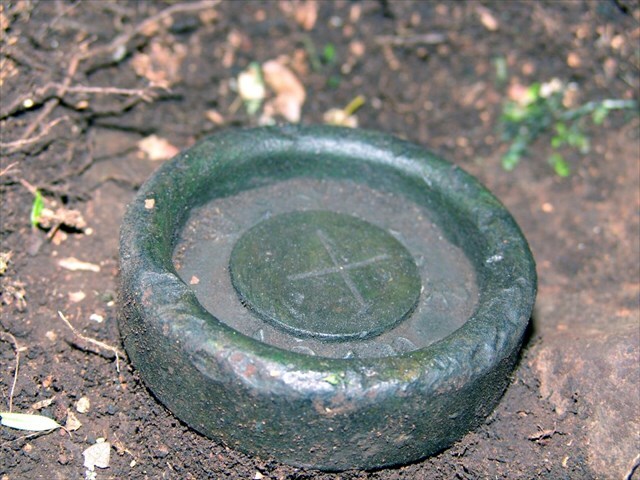 The fact that there is a triangle AND the letters "B - M" on the plate may indicate it was simply a multipurpose plate used for either purpose. 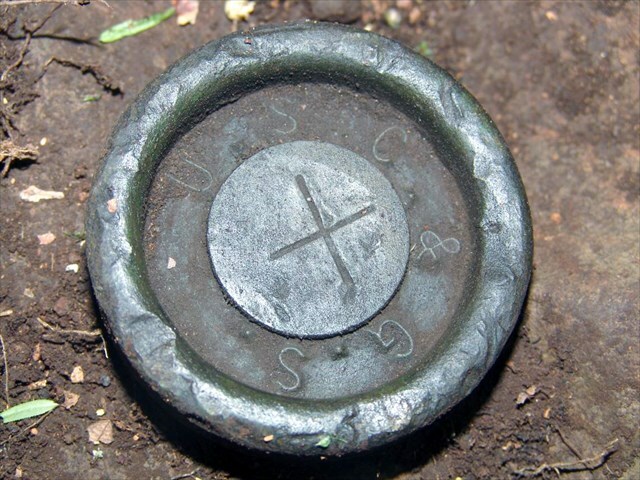 As has been mentioned before, the USGS seems to have used these "hermaphroditic" blanks for ever. And USGS disks certainly go back to the 1890s. 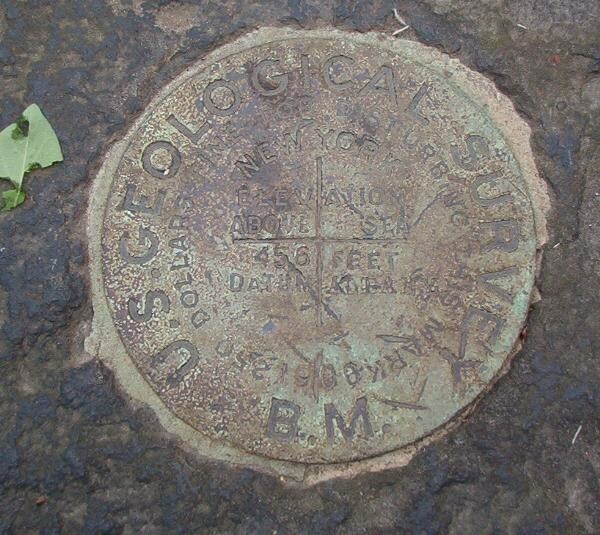 All USGS disks I have seen have a triangle in the center and the words "BENCH MARK" or "B.M." on the bottom of the rim. The actual usage is obvious from the context, or where these are listed by the NGS, from the datasheet. In this particular case, it's obviously a bench mark (from the elevation stamped on the disk) and the datasheet verifies that. And the dot in the center is a good place to center the pole. Geoides, Thanks for permission, the paper will be published on-line in the not-to-distant future. The “History Page” is being worked on right now. I will post a note on GC when the paper is on-line. The resolution of your posted photo is fine. Regarding the size of the square mark, I did some calculations and if the letters are 3/16” (the later USC&GS standard), then the size of the square comes out to just about 2” which is what one of the earlier recoverers stated. Papa-Bear, I showed a photo of this square mark to DaveD and he had never seen one like this before either. He said that it could have had horizontal coordinates which were not brought forward from the old Datum (probably due to missing observations or data quality, etc.). I don’t know why USC&GS ended up with some many different kinds of disks. My guess is that USC&GS officials wanted users to be able to easily distinguish between Triangulation Stations and Bench Marks (vertical control). Then, when the decision was made to require Reference Mark disks, they wanted to make sure that the RMs were not confused with the main Triangulation Station disk, so they were made differently. 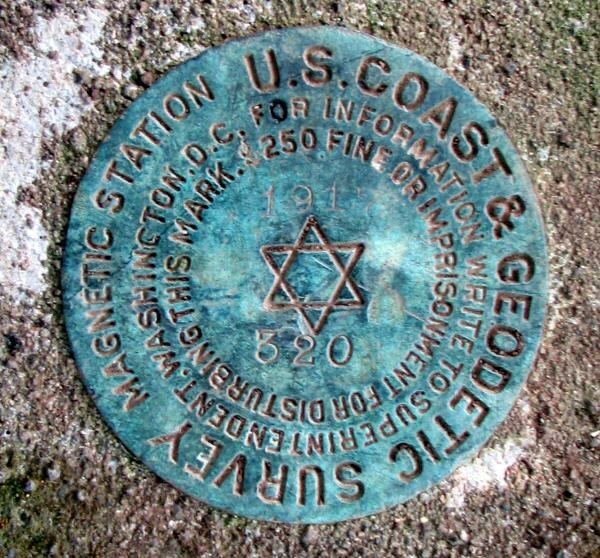 By 1921, there were five types of disks, Triangulation Station, Bench Mark, Magnetic Station, Reference Mark, and Hydrographic Station. The Traverse Station was added in 1924. By 1940, there were 11 types and by 1961 12 styles, some of which had changed. Recently NGS made the decision to have one type of disk. All, Remember July 15th midnight ET is the end of this photograph contest. This is not my recovery, but I noticed it in the gallery. There are a bunch of recoveries and some reasonable pictures. It's a 1910 USC&GS flat B.M. with the date stamped on the disk and it's in not-too-bad condition. Here's the GC page: HT1333 "H7"
Here's another by cjf H7 which is highlighted with talc or cornstarch or something similar. And there are 3 or 4 more photos. Papa-Bear, Thanks for the links to the photos of the 1910 BM. I have a photo of this type of disk from 1903 already, so I'm set. 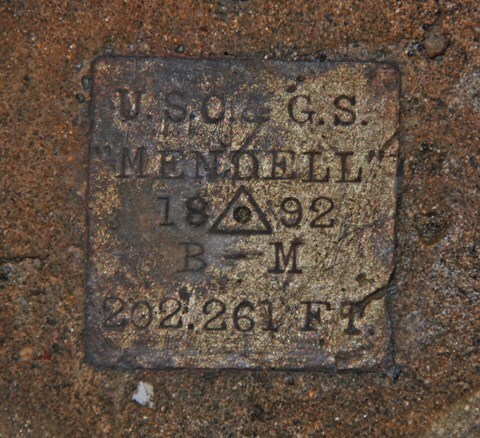 George, your contest award announcement reminded me that I needed to follow-up with a measurement of the Station Mendell mark. Still looking for disks? How about a USC&GS Hydrographic disk from 1971. AA0183. The datasheet was mislabeled as a Topographic disk. I stumbled upon it in the Florida Keys. I was excited to find the Hydrographic disk. Do you know if there are more somewhere in Florida? If you use GSAK it is easy to filter for HYDROGRAPHIC. I don't have Florida GSAK loaded, and it took awhile to scroll through the 41 hits for Oregon - most of which referred to hydrographic targets, but also several 1920 disks. One is the reverse of your situation: OA0334' A REGULATION TRIANGULATION MARK, NOT HYDROGRAPHIC MARK AS STATED IN ORIGINAL DESCRIPTION.